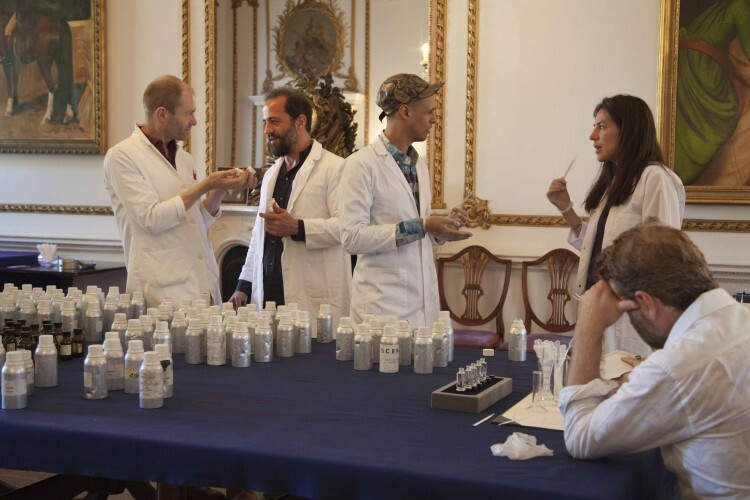 The second in a series of perfume workshops curated by Fiorucci Art Trust in collaboration with Creative Perfumers, London. Green as the prairies, Fresh as a child’s caress. 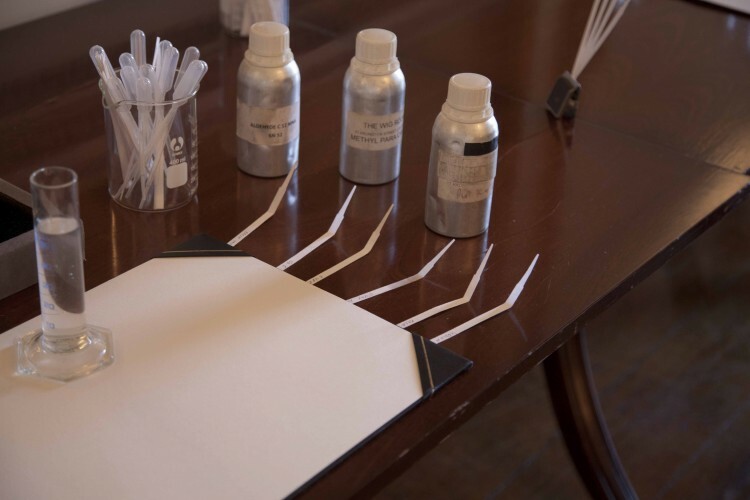 Participants: Michael Anastassiades, Stella Bottai, Adam Christensen, Adaham Faramawy, Milovan Farronato, Nicoletta Fiorucci, Adriana Lara, Tonico Lemos Auad. In Huysman’s Å Rebours, the protagonist, Des Esseintes, turns Baudelaire’s poems into perfumes, creating aromatic stanzas. 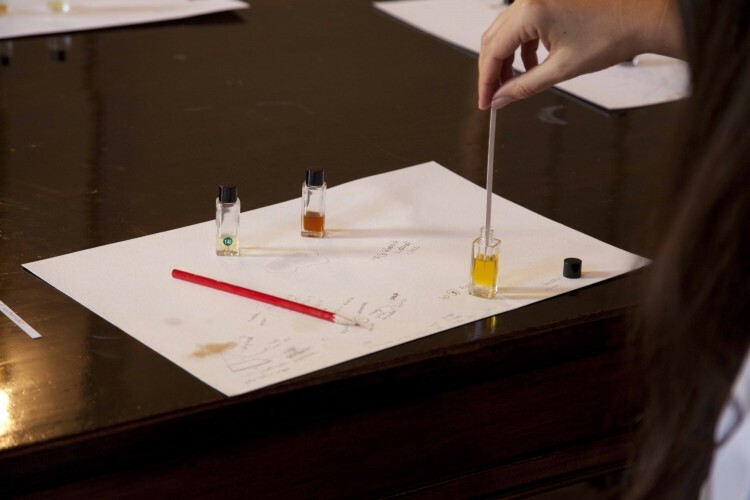 Perfumery uses the same terminology as music, similarly scent and smell are accorded with colour, and so it is apposite that artists with their innate sense of intuition and colour, transpose their art practices into the olfactory. 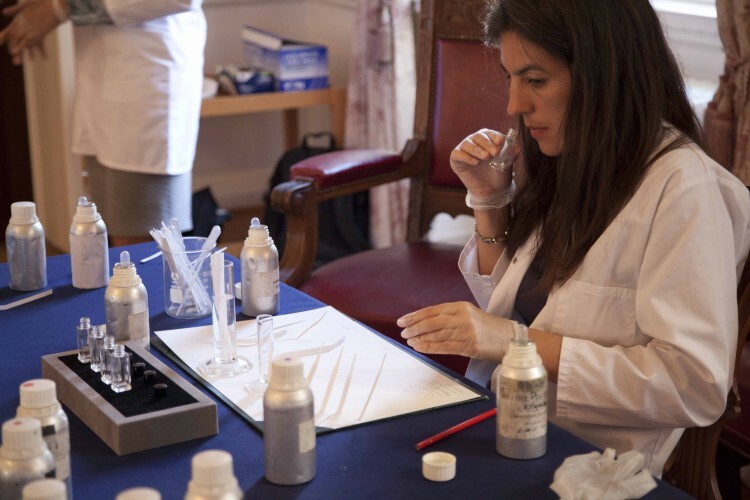 In the second scent work shop, a collaboration between Fiorucci Art Trust and Creative Perfumers, where, the neo classical splendour of the pink stuccoed and gilded state rooms of 21 Arlington House are the backdrop for artists to be what the French call ‘un nez’ (a nose) for one day. 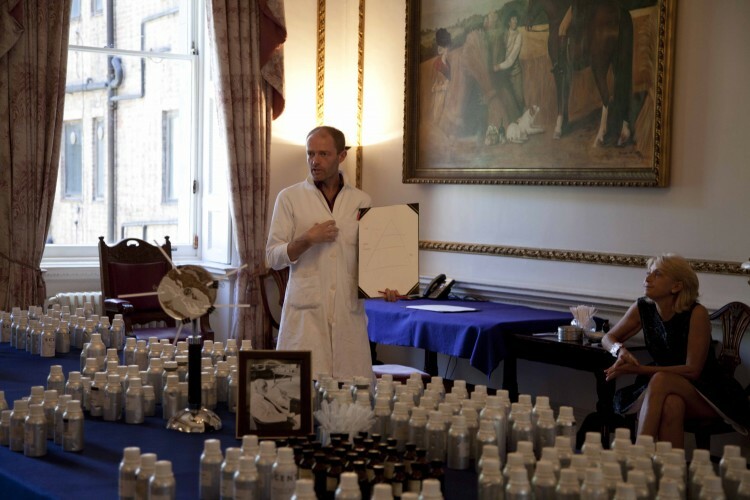 Artists are selected by Milovan Farronato, a curator and critic, to approach perfume as an art form. 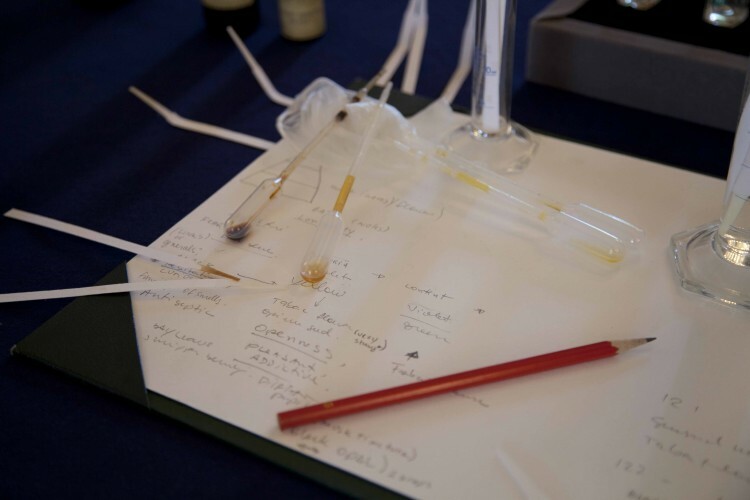 Having found a recipe, it is to be honed and harmonized as a formula at the Creative Perfumers Lab in the former ice cellars of the House. 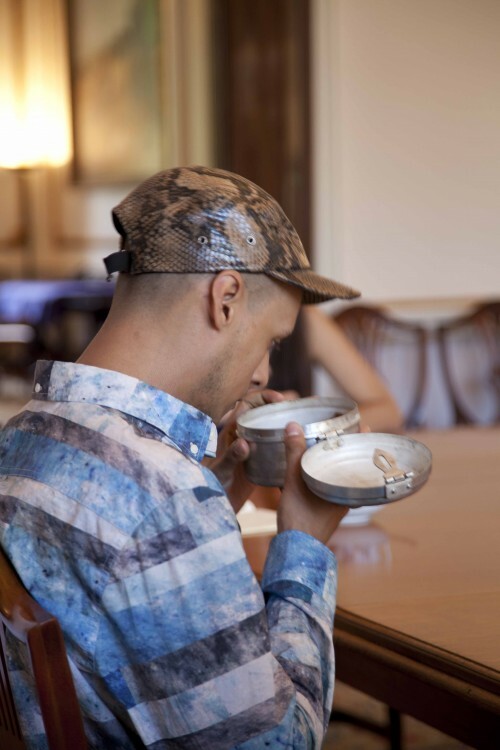 We are increasingly, a visual and oral culture, out of touch with our most primal sense, that of smell. 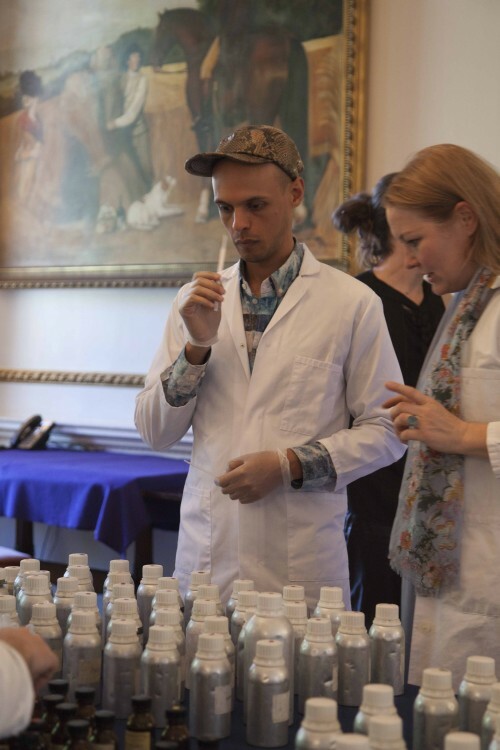 The nose is capable of recognising literally trillions of odours, according to recent research, and we have forgotten how to use this sense in our over deodorized environments. 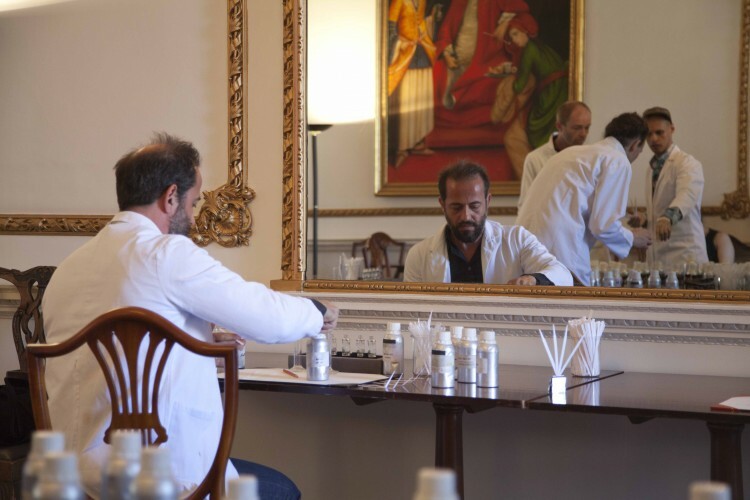 The ‘Fragrances’ of celebrity-hyped brands has robbed scent of its mystery and allure, until all the gods have departed. The prevailing trend in contemporary art, is that of the immersive installation, where sound and light play a part. 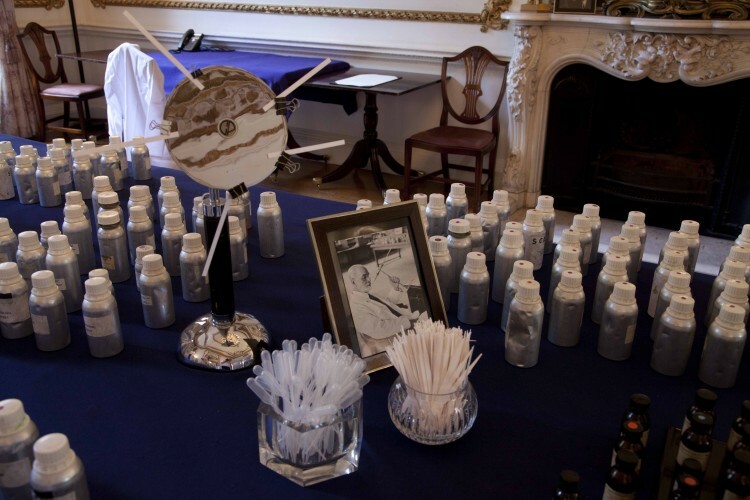 And so too can smell, and perfume be used as an artistic medium, to create a ‘smell-scape’, expanding the theme of the transient and fugitive in art. We tend to undermine the great power scent holds; it is freighted with memory and emotions. Moreover like art, its development charts the spread of civilizations, the movements of faith and the links between the ancient, classical, medieval and modern worlds. 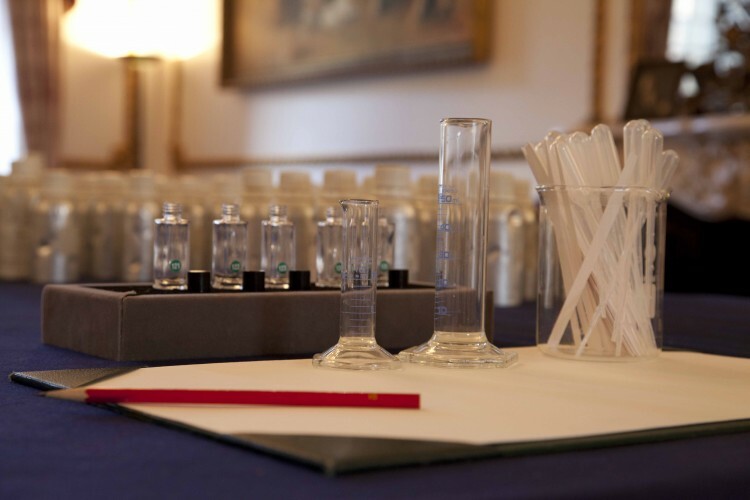 For any neophyte, the complex and heady world of perfume and the sight of hundreds of silver aluminum flasks of scents unguents, essences and compounds is daunting, until one assimilates the ‘families’ and groups of notes and accords, which then come in to play. The families are ranged across the mahogany drop leave banqueting table as Green and herbal, the Hesperides Citrus essential oils: Fougere, (fernlike,) Chypre (that takes its compound from a patchouli and oak moss infused cotes bouillon; Coty’s creation Chypre in 1917, ) woody, leather, oriental and floral, together with the synthetic and animalic aromas in smaller brown phials, used as fixatives, that enhance a scent and stops it from being too evanescent , while the aldehydes give a scent, distance , thus leaving a trail in its wake. 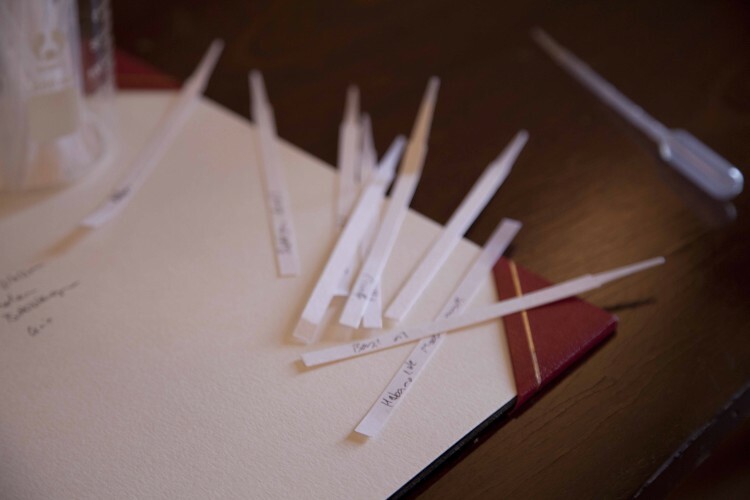 The labels and names range from the prosaic to the poetic, such as bubble gum and warm milk to more exotic far-flung places like Siberian Pine or Omani Frankincense. As the bottles were opened to emit enticing and intoxicating aromas, pungent and powerful, they floated away on the zephyrs blowing in through the French windows, so as not overpower. 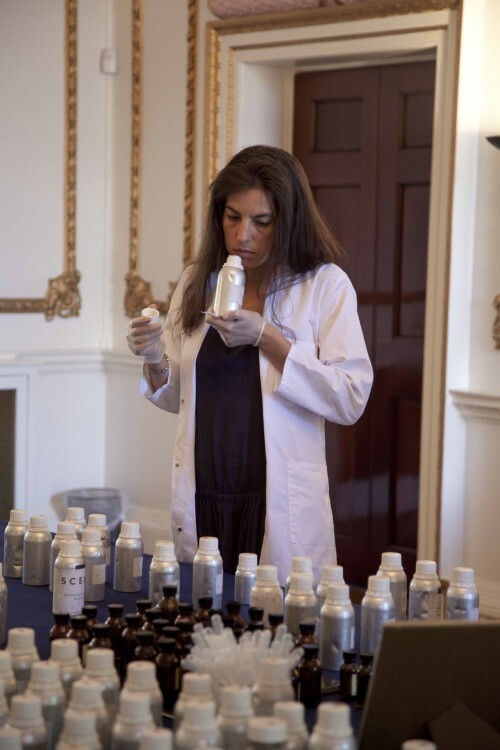 Nicoletta Fiorucci, who has made all of this possible, breezes in her bespoke scent concocted by Anastasia Brozler, of Creative Perfumers. Called ‘Evil under the Moon’, the title is taken from an Agatha Christie ‘who dunnit’, (that takes place on a remote island,) which in Nicoletta’s case is the volcanic island of Stromboli and her scent contains wild fennel and night-blooming flowers like Jasmine and the carnal narcotic Datura Flower, redolent of Stromboli’s strange and singular atmosphere. 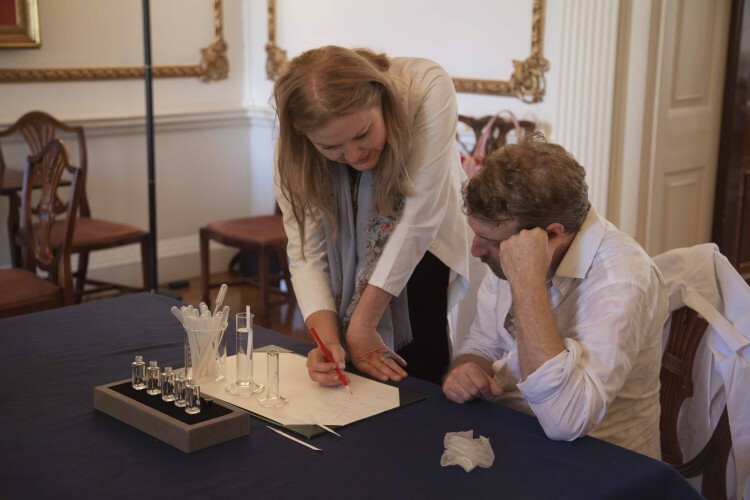 Anastasia Brozler and Rhydian Jones, the noses behind Creative Perfumers, gently guide, inspire and inform the artists of the rudiments of perfumery, explaining how to use pipettes to draw out the essences and scent strips, like blotting paper, which absorb the oils and allow the aromas to ‘float’. A pyramid diagram is shown, effectively, as a song sheet, from which to build up base, heart and top notes. According to Proust, each hour of our lives is stored away in a smell, while the more prosaic explanation is that the connection between smell and memory is so strong, that the olfactory nerves transport information to the brain’s limbic system, (where memories are formed, emotions regulated and smells are lodged) and to the cortex. 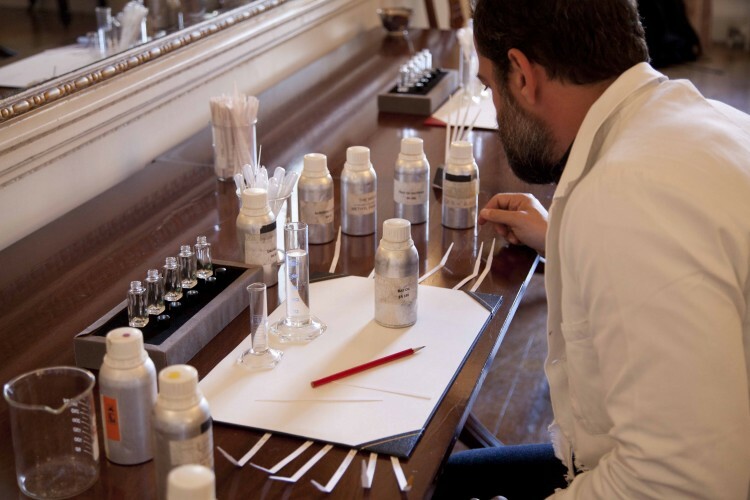 This journey explains those magical moments when a trace of scent reminds us of childhood, a beloved or landscape, such is the alchemy; blending the right ingredients for the scents and the chimaeras they can create. Scents are seductive pipe dreams; they endow you with an aura, an invisible cloak. 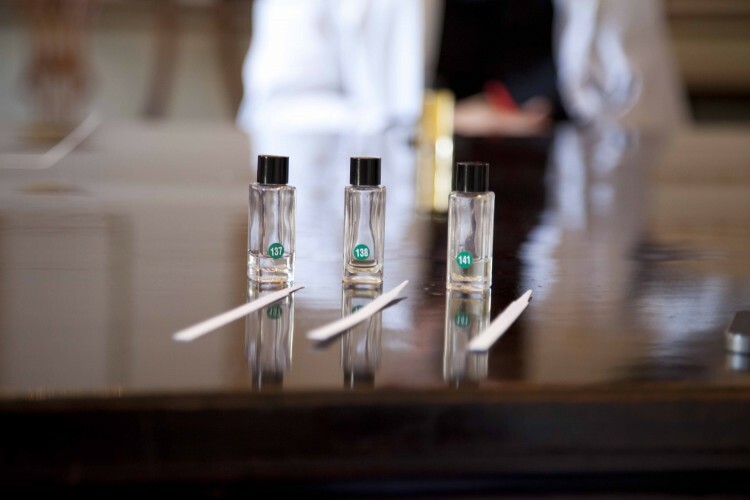 The artists approached the workshop, without any preconceptions of what a scent should be, firmly leaving the perfume counter and celebrity culture of the fragrance industry; (the Muzak of perfume,) by the door. 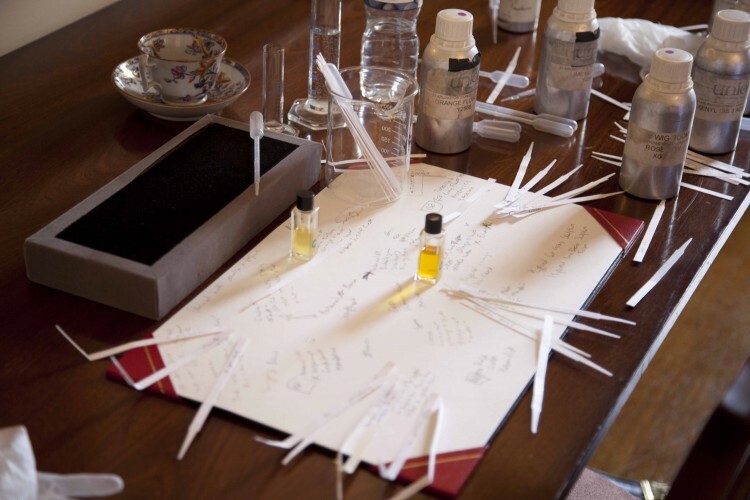 Artists are innovative perfumers, imaginative, rather than simply walking in and saying ‘I want to recreate my favourite perfume such as Opium or Jicky’, they tirelessly seek a scent to evoke a mood or an environment, intentionally or unintentionally, they sometimes discover a scent or a certain smell that could be incorporated into their art. In the 1st millennium B.C the priests were the perfumers, the skill of grinding up pastes to make incense and unguents, using hundreds of ingredients, was considered a mysterious and esteemed art. 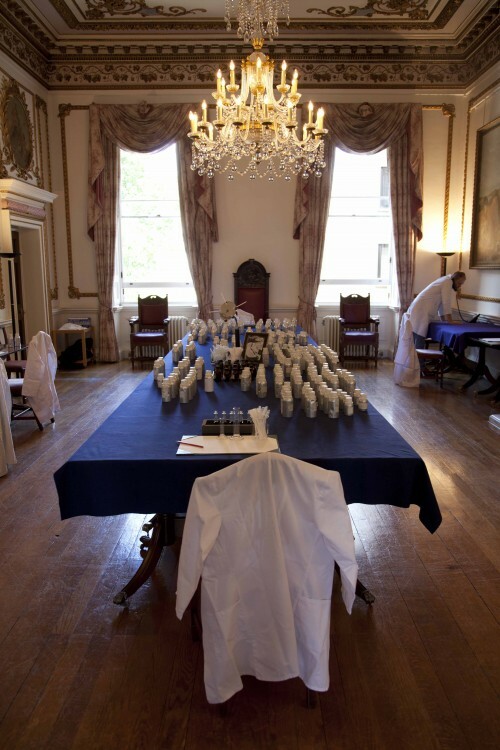 In the 2nd millennium, maybe it will be the artists, who will be perfumers in the temples of art? 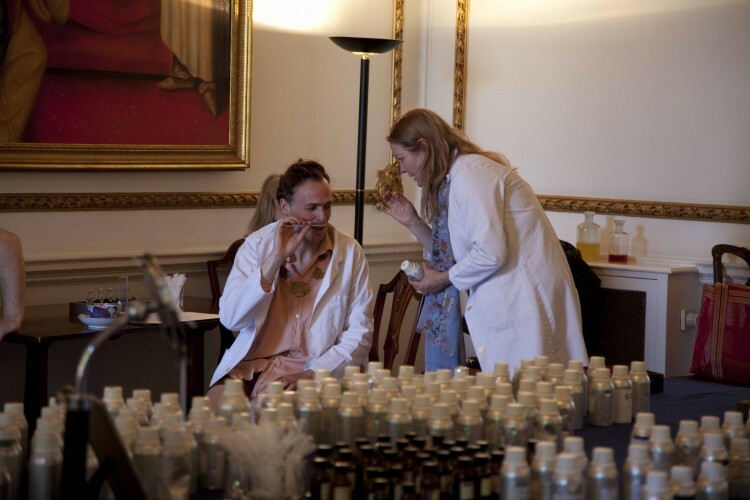 Celia Lyttelton is the author of The Scent of Trail, An Olfactory Odyssey, published by Bantam in the UK and Penguin in the USA.